Guinea Pig Warrior is an entry to the 20th Ludum Dare 48 hour game development competition. Given theme was “It’s Dangerous to go Alone! Take this!”. 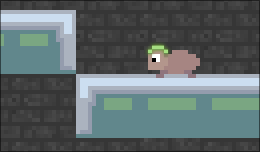 Somewhat basic platformer gameplay with one twist, a “temporal projection” of yourself. As usual, I spent a lot of the development time honing some small details, and as a result I didn’t end up spending enough time to create actual level content. tiny feeling of dynamicness. The music section changes based on what position you are in the level, so it keeps playing the same partial theme when you are in a particular position. I didn’t have time for sound effects, and in retrospect I think that with this limited amount of level content the level section separation for music system was bit of an overkill.